To add an introduction or summary to your interaction, mark the check box for either item in the Steps panel on the left side of the screen. To add content to an introduction or summary, use the text, audio, and media panels on the right side of the screen. Double-click the item in the Steps panel to open it for editing. Type a new name, and press the Enter key. Select the item in the Steps panel, and type a new name in the title field at the top of the text panel. 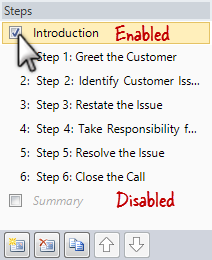 To remove an introduction or summary, uncheck the box for either item in the Steps panel on the left side of the screen. Removing an introduction or summary doesn't delete any content you may have previously added. It just hides the content, so you won't see it when you preview or publish. 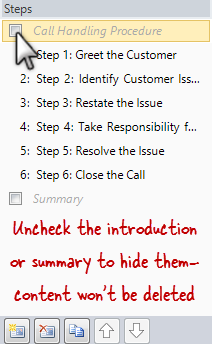 If you change your mind about hiding an introduction or summary, just mark the box again, and your content will reappear.